The lightweight, multi-function X-CUT is made from alpha (hardened) titanium. Its blade offers both serrated and smooth cutting edges, along with a line cutter. The blade is specially designed and shaped to maintain a highly durable cutting edge for a long life of corrosion-free performance. The no-nonsense handle is contoured and offers finger indents and a thumb guard to enable you to maintain a firm, non-slip grip when bearing down on a serious cutting job. 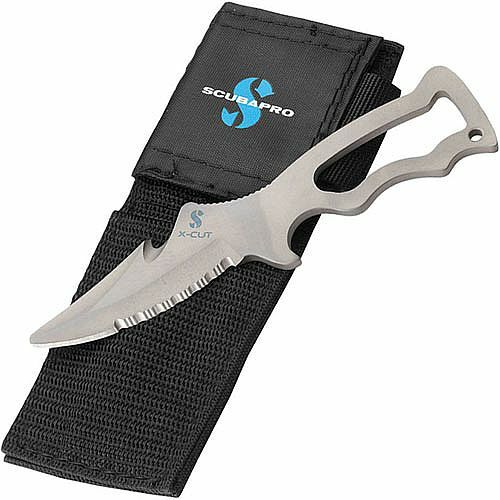 An eyelet is provided to run a lanyard to make sure the knife stays with you. Titanium blade maintains a sharp edge. Low profile protective sheath features a Velcro closure and is designed specifically to fit on a tech harness waistband.